LONDON: 2 AUGUST 2016 - The directors of ECR Minerals plc (the “Board”) provide the following update on ECR’s strategy and activities. The Company is concentrating on its activities in Australia, which currently comprise the Avoca and Bailieston gold projects in Victoria. This reflects the attractiveness of Australia as an operating environment, particularly for gold projects. Australia offers security of tenure, low political risk and access to all necessary skills and services for mining projects. In addition, the Australian dollar gold price is at close to a record high, and the Group expects to have the benefit of significant tax losses in Australia (for further information on the tax losses in relation to this project please see the About ECR section below). As previously announced, ECR is working on a conceptual economic study in relation to the proposed reprocessing of alluvial waste dumps at the Avoca project in order to extract remnant gold. The principal outstanding items in relation to the study are: 1) the receipt of metallurgical testwork results from the independent laboratory carrying out the testwork, which are due shortly; and 2) compilation of resource estimates for multiple dumps, which is ongoing. The Directors recognise that the above work streams have taken longer than originally anticipated to complete. Strong demand for laboratory testwork services in Australia and the need for additional check assays has led to delays which, although frustrating, highlight Australia’s role as a leader in the revival of the gold mining industry. The study will be completed as soon as possible following receipt of the testwork results and completion of the resources. A batch of encouraging assay results from samples (all samples screened to -600 microns, in line with the anticipated processing method for the dumps) taken from the Golden Lake East dump were received late last week, and included grades of up to 4.12 g/t gold, with all seven samples averaging 3.4 g/t gold. These assay results will be incorporated into the Golden Lake East resource, although they should not be taken to represent the likely resource grade or as representative of the entire dump. 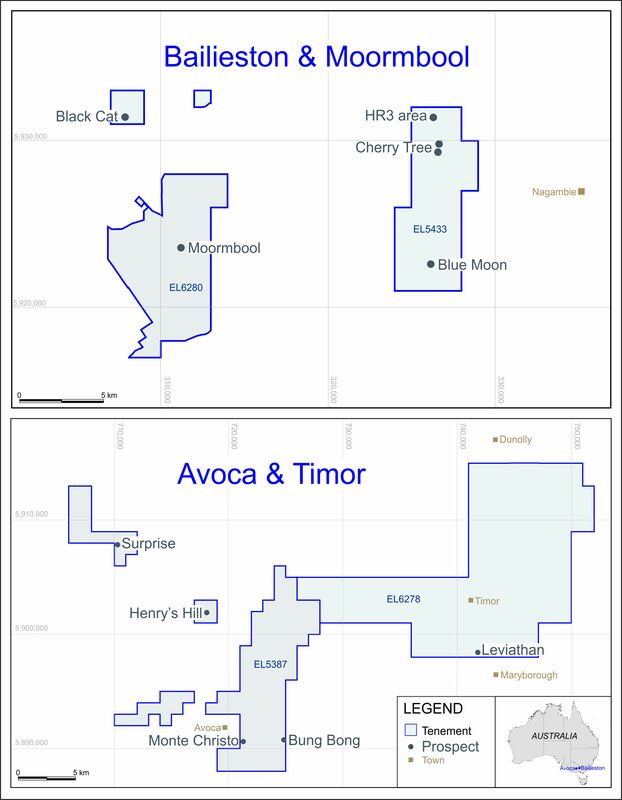 Further to the Company’s announcements dated 13 June 2016 and 30 June 2016, reconnaissance sampling within the Exploration Licence (“EL”) application area (as defined in those announcements) in the vicinity of the Avoca project has begun, along with surveying of the larger dumps to enable resources to be estimated after sufficient sampling has been carried out. The dumps within this EL application area are not included within the JORC Exploration Target announced by the Company in relation to the Avoca waste dumps, nor will they be included in the conceptual study and resource estimates which are currently being produced. Quartz vein hosted gold and related placer-style “deep lead” mineralisation in the Avoca EL. This concept is premised on the considerable mining history of such deposits at Avoca and a significant historically identified potential gold accumulation within buried river channels, derived from drilling conducted in the 1930s. Epithermal “Carlin” style disseminated or sheeted vein hosted gold mineralisation at the Bailieston EL. This concept is premised on the presence of such a deposit that was recently exploited at Perseverance’s Bailieston mine, immediately north of the tenement and considerable evidence that the structure that hosts this deposit is repeated within the Bailieston project area. Other modern nearby open cut gold operations which operated include Hill 158 at Nagambie, Red Hill at Heathcote and the various pits at Fosterville and Costerfield. These latter two continue to operate as higher-grade underground mining operations and Fosterville has recently produced its one millionth ounce. Further information regarding both projects can be found in ECR’s previous announcements, including the Company’s announcement dated 20 April 2016. When the conceptual study on the Avoca waste dumps is complete, the Company will be in a position to consider next steps for the Avoca project and the potential for revenue generation from this project, and how it may be financed. Possibilities for financing could include a joint venture or spin-out, involving either or both of the Avoca and Baillieston projects, or continued financing by ECR. The Company announced on 4 July 2016 that it had raised net proceeds of approximately £323,750 by way of a placing of new shares (“Placing”). The Company announced at this time that it intended to use the net proceeds to repay all amounts owed by the Company under the convertible loan facility (the “Facility”) in place with YA II PN Ltd (formerly known as YA Global Master SPV Ltd), an investment fund managed by Yorkville Advisors Global LP. the Company has been subject to adverse social media and internet comment concerning, inter alia, threats to requisition a general meeting and/or effect changes to the make-up of the Board. As a result of the above, the Board consider that the Company’s ability to raise additional equity financing on acceptable terms has been affected, at least in the short term. Therefore, for the time being, the Board do not consider it is in the interests of the Company to make any repayment of the amount owed by the Company under the Facility until the Company has been able to secure additional working capital (of which there can be no guarantee). The outstanding principal amount owed under the Facility is currently US$400,000 (approximately £302,000 at current exchange rates). The Company’s current cash position following completion of the Placing is approximately £375,000. The Board has for several months been reviewing ECR’s corporate strategy, cost base and management structure with a view to identifying any changes which may be appropriate. A decision was made several months ago to close the Company’s London office, by early 2017 at the latest, in order to reduce overheads, and further cost savings are being made across the Group where possible. A number of potential paths for the future development of the Company are being considered, some of which may involve a change to the make-up of the Board. The market will be updated with any material developments. Stephen Clayson, Director & CEO - £50,000 per annum. The Company wishes to clarify that, as disclosed in the Company’s audited financial statements for the year ended 30 September 2015 (page 29), Stephen Clayson is currently owed £100,000 by the Company as a result of voluntary salary deferrals during calendar years 2014 and 2015. These deferrals are equivalent to an interest free loan to ECR, and helped ensure the Company was able to complete its exploration programmes. Given the continuance of commentary regarding the Company on unauthorised and unregulated websites, investors and shareholders are warned to exercise caution in dealing in the Company's shares and if in any doubt seek the advice of a person duly authorised and regulated by the Financial Conduct Authority (FCA). ECR is a mineral exploration and development company. ECR’s wholly owned Australian subsidiary Mercator Gold Australia (MGA) has agreed to acquire 100% ownership of the Avoca and Bailieston gold projects in Victoria, Australia. Mercator Gold Australia is estimated to have tax losses of approximately AUD 66M as at 30 June 2015, which may be available, subject to certain conditions (as described in ECR’s announcement dated 4 December 2014), to reduce MGA’s future taxable profits. This is considered particularly significant in view of an opportunity which may exist at Avoca to establish relatively near term gold production from the reprocessing of historical mine dumps, with the potential for sale of gravel and sand by-products. A competent person’s report in relation to the Avoca and Bailieston projects is available for download from ECR’s website. ECR has the right to earn a 50% interest in the Danglay epithermal gold project in the Philippines. Danglay is an advanced exploration project located in a prolific gold and copper mining district in the north of the Philippines. An NI43-101 technical report was completed in respect of the Danglay project in December 2015, and is available for download from ECR’s website.